There are so many car cleaning products on the market i wouldn’t like to count them. There are of course Autoglym, Mer, Turtle, Sonax, 3M, Meguair’s, PoorBoys, Chemical Guys, etc. All have the same goal to provide the best clean with the least amount of effort. Some achieve this and the results are very different from brand to brand. I will use the best of what I can, the cleanser, shampoo, wax, high performance wax and so on depending on the job. If you spend the time you will get fantastic results, but not everybody has the time. So manufacturers provide alternatives like wash & go shampoos, spray on wax, tubs of wax the list goes on. The company Greased Lightning have something called water free and hassle free finish. I purchased this from one of them TV shopping channels and it looked good, and I thought I would give it a go. I got two bottles of the mixture one litre in each for a relatively small price about three years ago. I will try to show the difference of the clean on the car which will be difficult at the best of times. What is this product like? How does it perform in the real world and not a carefully constructed TV commercial? Firstly the fact you do not have to wash the car first goes against everything I expect to clean a car. Buckets of clean water to wash the dirt of, chamois leather it dry, wax and polish. This polish requires no water as the mixture, if my memory serves me correctly from the advert; “lifts the dirt and holds it way from the paintwork to avoid the damage while cleaning”. A pretty bold statement I must say. The product instructions. “Shake well. Liberal spray onto the body work, one panel at a time. Wipe over with a clean, dry microfiber cloth. Buff to a shine with another clean microfiber cloth.” The mixture separate into very distinct liquids when left standing on the shelf. Once mixed it looks like a single cream mixture. The bottle is the usual trigger mechanism with an adjustable spray nozzle. The nozzle is best when it squirts a circular amount rather than the jet. The mixture is easy to rub into the paintwork and takes very little effort. The mixture does indeed lift the dirt of the paint and allows an even spread. The fact it lifts dead bugs of the paint as well especially at the front is a major bonus. I allow the application to dry which doesn’t take long, about the same time it takes to apply to the next panel along. I then go back and buff the mix of to give a streak free clean in theory. The fact that the cloth now holds potential dirt, grime, micro stones and allsorts or paint killer materials is a little worrying to be honest. So I start at the top and work my way down, roof, hood, trunk, fenders and doors. I leave the sills to last and then the wheels. The amount of dirt on the cloth after the buffing is depending on how much dirt there is on the panel. In other words leaving clean mixture on the paint will result in a pretty clean bufin cloth. I recommended that the cloth is turned on a very regular basis to stop the spread of the dirty mixture and the collection of dirt being dragged over the body work. I don’t care what they say, a spray wax will not stop sand being rubbed into the paintwork before being buffed off. So I would say in the worst case scenario wash the loose stuff off first, dry then apply this spray wax. This will save the dirty rag or two of them depending on the dirt to get the car clean. The mixture cuts through the dirt easily and take bird lime off the paint too. The buffing of the powdery like dried mixture is easy to buff away and again a frequent turn of the cloth makes light work to bring up a shine. The chrome work shines as well after the buffing. This mixture is non abrasive like the legendary “T-Cut” which will remove the top layer of the paint formulation. The wheels; I have alloys which get smothered in the brake dust and is a real pain to clean. Luckily the design of the wheels is gentle curves and no harsh edges. This will require very regular turning of the cloth. If the cloth gets sodden with the mixture and it gets dirty you will end up rubbing dirty mixture around the wheel. Not to much of an issue but it will take time to buff out of the detail areas like the centre logo or lug nuts. On the paintwork it is easy to remove the dirt and easy to buff to a shine. Total time for the car the was about half an hour. If you get this stuff on the black plastic trim it’s the same old story; it will leave the marks. Back to the Gibbs Brand to remove the over spray or buffing marks. The wheels it does not fair so well on, the black brake dust sitting in the scuffs where the rims have been kerbed does not come out, stubborn brake dust will take a few rubs and will not get the alloys back to the pristine look. Close up you can see the dust in the flaws of the wheel. For the wheels I would use a dedicated alloy wheel clean to remove the dust and then wax with the mixture. They say you can use this on the glass, I will not apply the mixture to the windscreen nor any other glass for that matter. I use Fast Glass by Autoglym or any household glass cleaner in fact. The end results last a while and the water beads nicely of the paintwork fine. But, I find the shine is still there but goes a little flat and the water does not bead as well. application once a month would keep it topped up. However; there is no match for a deep cleanse, shampoo, wax with a quality product. If you want to see depth of shine then it’s back to old school I’m afraid. The application will come of easily, but you can see buff marks in the sun and some places require an additional buff to to remove those greasy marks. This is easier than a hard wax and buff, but having to go over bits again you would be better of with a proper wax. For a limited use on a not so dirty car, looking for quick shine then this is not a bad product at all. I estimate that the one litre bottle will do about 15 complete cars. The Toyota Avensis I have is not a small car in fact its about as big as most estates without the rear opening as its a hatchback. I have marked up the bottle with how much is left. On a dirty car with the wheels I would expect to use most of this with a little left over. If I use a sensible amount of the mixture to apply, then I might just get two out of this amount on a fairly clean car. On a smaller car maybe twenty washes? But, it depends how much you apply at the end of the day. It appears that my trigger has gone a bit mental as it nears the end of the bottle, the mixture was dripping out onto my hands. The first bottle was fine, the second bottle was fine until I started using it this time! It wasn’t to much as I just flicked it onto the paintwork and rubbed it in. However, that is not the point. Getting this stuff on black plastic will leave the marks on there. Avoid hard palstics and rubber. The results of this product are very good indeed as long as you take it in the context of the product, this is for slightly dirty cars. For a car showroom this stuff would be great as they will quickly polish many cars in a short space of time, and there is not dirt or grit to mark the paintwork. If you are going out somewhere and you need to clean the car in a hurry then this stuff really does do the job it says it will. I use this stuff on a cold day when the water option is limited or I need to go out somewhere in a clean car quickly. Such as job interview, date or going out for the day etc. If the car is seriously dirty, then wash it with an all in one car “wash & wax” and then dry the car. I have always been a little disappointed with the results of the brake dust removal in the imperfections of the wheel. But if your on your hands and knees to inspect it then it has done a good job to make you look that close anyway. I will always have a pot of this stuff as a “stand by” on my car cleaning shelf for a quick buff up of a not so dirty daily driver car. I knocked a marks off for the wheel clean issues. The paint will sometimes need an addition rub after the buff to remove the real stubborn marks or dirt such as road tar etc. 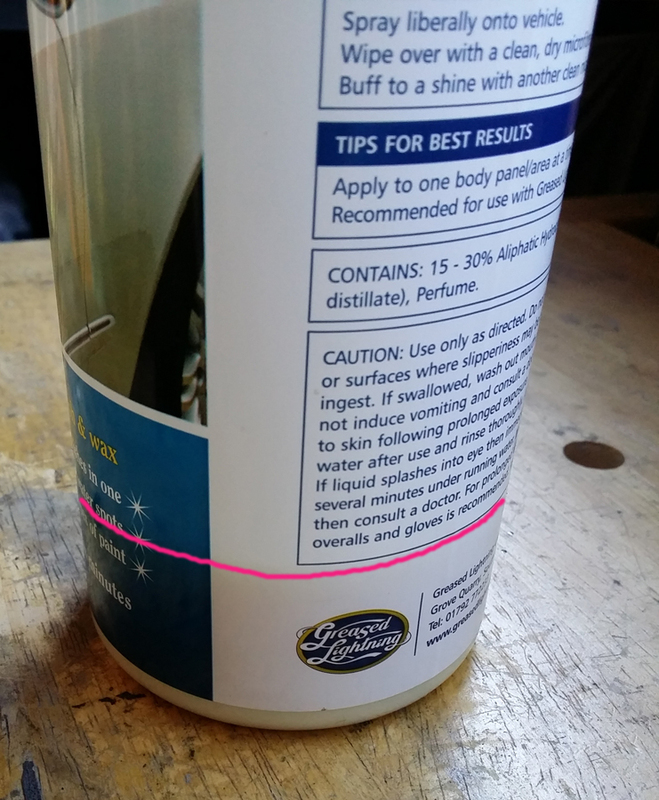 If you are not careful this product will leave a greasy mark that requires additional buffing to remove. The results are not car detailer standard, but for a quick fix it will be fine. Would I use it on a filthy dirty car? No, the product may be able to hold micro bits of dirt away, but when you have larger bits of dirt stuck to the cloth, it has to touch the paintwork. Would I use it on my Mustang? No. There are many places that stock this now and I will be getting mine from Mustang Maniac in the future as they are now stockists of this very good product, for what it does.